Save money now by migrating your printed output, like invoices and statements to Electronic Forms. Form overlays are the electronic equivalent of preprinted business forms. The figure on the right shows a sample carbon copy form that can be converted to a multipage online form. You will also notice that when you migrate to an electronic form that you can completely change the presentation of the data and even includes charts/graphs of some of the data. All this can be done without changing the original output print data from the application. If you are creating a new application or are able to modify the original application there is a whole lot more you can with with the new output. It can be Emailed, or published on the Web. Why do print presentation from within your server application when you can use one print presentation product to Front End all your applications. This can be done using E.O.M. Data Dependent Attribute (DDA) Designer. DDA Designer is used for advanced document reengineering and reformatting. For example, DDA can move and manipulate print data based on the content and location of the data in a print file. 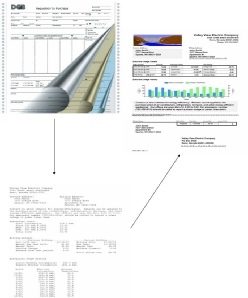 With DDA, you can customize print data without changing the applications that produced the data. DDA options include loading electronic forms, changing fonts, moving or discarding text, and printing PostNet bar codes. Any Enterprise Output Manager system can use DDAs created by another Enterprise Output Manager system. DDA Designer is not needed for electronic forms if the print file is already correctly formatted to fit the form – usually because the electronic form is an exact image of a previous “real” pre-printed form.